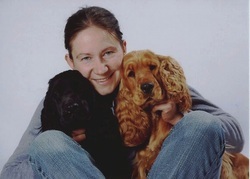 I am very happy that you are interested in visiting me and my English Cocker Spaniels in the www! First of all I would like to introduce me and my cockers to you. in Merzen, a small village in Niedersachsen, Germany. I have lived with cockers all my life and could not imagine living without those lovely and beautiful dogs. 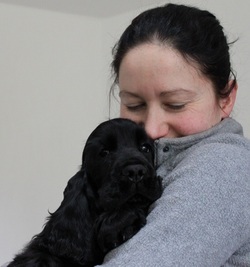 After showing my mother´s and other owner´s dogs for a few years in I took my first own dog home in August 2009. His name is "Victor Black Petrs". He is a red male and I call him "Peter" as he was bred by Petr Studeník ("Kennel Black Petrs"). He is the best that could have happened to me and grew up to a very charming and lovely young man who first of all is one of my best friends and additionally is very successful in the show ring. You can read more about my "Peter" at "Victor Black Petrs". Only a few months later in June 2010 I took home also from Petr Studeník my second dog "Zodiac Black Petrs" who is called "Zody". He is a black male and completely different from Peter in type and character. On the one hand he has very much temperament and is very wild, on the other hand he is very gentle. And he also started very successfully in his show career. You can read more about my little boy at "Zodiac Black Petrs". Since January 2011 We have a new member again from Petr Studník in our family: Little black male "Colman Black Petrs" who is called Justus. Look here what a charming boy he is. Petr Studeník (Kennel "Black Petrs") - Thank you, Petr, for allowing me to own my wonderful boys, for your support and for your friendship which means very much to me!